Broadcaster Press 07 January 10, 2012 www.broadcasteronline.com 1220 Vans For Sale: 1994 Ford Conversion Van, 165,000 miles. Runs and looks like new. $2800 firm. Phone (830)613-0413 or (605)659-4524. 1250 Motorcycles Buying ATVs, and Side by Sides 1995/newer. Prefer projects. Will pick up. Call (402)371-7002. WANTED JAPANEESE MOTORCYCLE KAWASAKI 1967-1980 Z1-900, KZ900, KZ1000, ZIR, KZ1000MKII, W1-650, H1-500, H2-750, S1-250, S2-350, S3-400 Suzuki GS400, GT380, CB750 (69.70) CASH PAID. 1-800-772-1142,1-310-7210726 usa@classicrunners.com nani 1255 ATVs 2008 Yamaha Rino for sale call (605)661-2418. 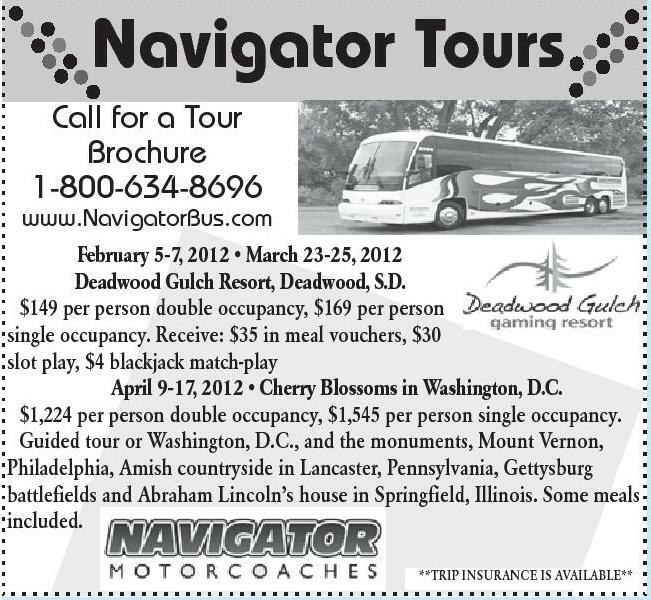 1400 Navigator Tours 1410 Call for a Tour Brochure 1-800-634-8696 February 5-7, 2012 • March 23-25, 2012 Deadwood Gulch Resort, Deadwood, S.D. $149 per person double occupancy, $169 per person single occupancy. Receive: $35 in meal vouchers, $30 slot play, $4 blackjack match-play April 9-17, 2012 • Cherry Blossoms in Washington, D.C. $1,224 per person double occupancy, $1,545 per person single occupancy. Guided tour or Washington, D.C., and the monuments, Mount Vernon, Philadelphia, Amish countryside in Lancaster, Pennsylvania, Gettysburg battlefields and Abraham Lincoln’s house in Springfield, Illinois. Some meals included. Sucker Rod & Pipe. All sizes for fencing and manufacturing. Menno, SD. (605)387-5660 (605)661-5050. 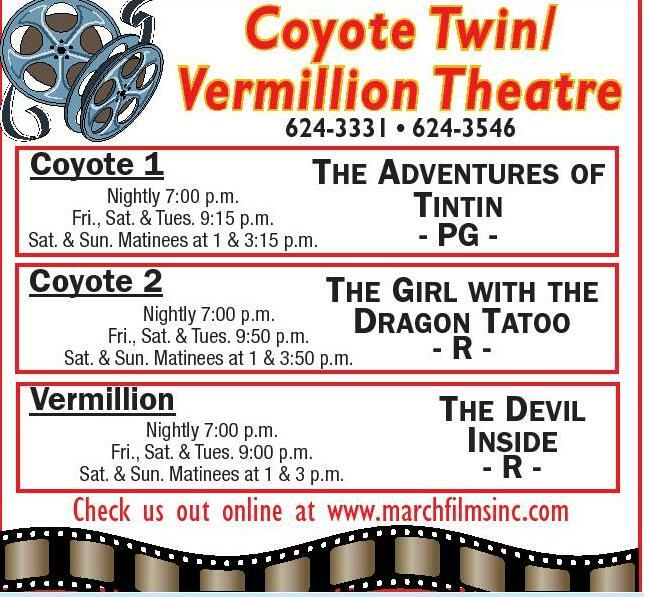 1450 **TRIP INSURANCE IS AVAILABLE** Coyote Twin/ Vermillion624-3546 Theatre 624-3331 • rmillion Ve y mmunit Co n reciatio App Days Coyote 1 THE ADVENTURES OF TINTIN Nightly 7:00 p.m. Fri., Sat. & Tues. 9:15 p.m. Sat. & Sun. Matinees at 1 & 3:15 p.m. Coyote 2 • • • Appreciation Days Coupon To show our appreciation for your continued • support we would like to “feed” you. Stop In On January 11 , 12 , 13 • or 14 And Let Our Friendly Staff • Serve You A FREE Meal • • th Agriculture 4WD QUALITY OFF-ROAD MINI TRUCKS FOR SALE 40MPG automotive engine, HEATER, full FUNCTION Cabs & more, several models to choose from. www.ulmerf a r m s e r v i c e . c o m (605)387-5660 or (605)661-5050, Menno, SD. www.NavigatorBus.com th - PG - THE GIRL WITH THE DRAGON TATOO Nightly 7:00 p.m. Fri., Sat. & Tues. 9:50 p.m. Sat. & Sun. Matinees at 1 & 3:50 p.m. Vermillion Nightly 7:00 p.m. Fri., Sat. & Tues. 9:00 p.m. Sat. & Sun. Matinees at 1 & 3 p.m. -R- THE DEVIL INSIDE -R- Check us out online at www.marchfilmsinc.com Includes non-alcoholic beverage. Dine-in only. Limit one coupon per person. Must present coupon at time of purchase. We are family friendly, children friendly and offer great food, nice atmosphere and excellent service. We are proud to have had the same cook for the past fifteen years and we are ready to serve you. i Specha.l.s ing at t e . Even Tuesdays & Wednesdays Chicken Strips.............................................................................................................................$10.99 Southern Fried Boneless Chicken Breast.....................$12.99 Alaskan Walleye.....................................................................................................................$12.99 Taco’s & Burrito’s..................................................................................................................$10.99 Fridays & Saturdays Alaskan Walleye.....................................................................................................................$14.99 Sundays 11AM-4PM Vermillion • 624.7670 All You Can Eat Omelets......................................................................................$9.99 EVERY TUEDAY & WEDNESDAY KIDS EAT FREE! 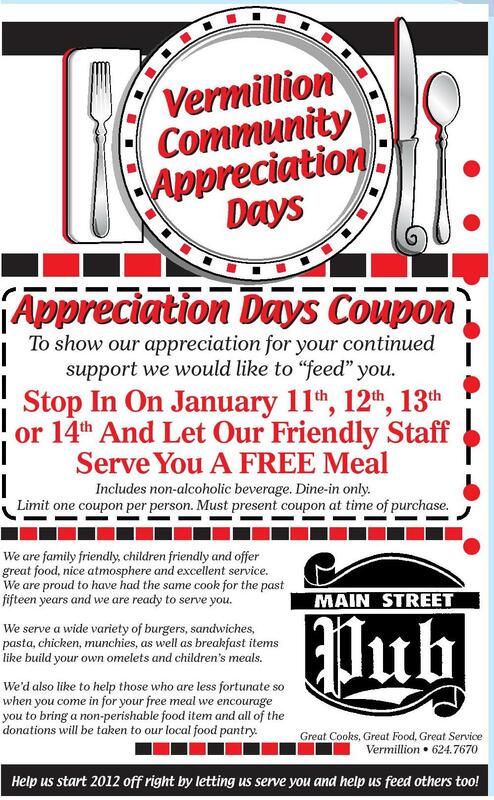 Free Kids Meal w/Adult Meal (2 kids per adult) Help us start 2012 off right by letting us serve you and help us feed others too! Contractors 1475 Other Services Dump Cable! Watch 150 of DIRECTV's best channels for only $29.99 per month, or over 220 channels and free HD for life for only $34.99. There is no better value than DIRECTV! Call Americom and get quality personal customer service from a local retailer. Trust us to hook you up! 605-201-1984 Lawn Landscaping 1500 Moving - Storage Maskell Storage Units - Units available. Please call (402)692-6000. 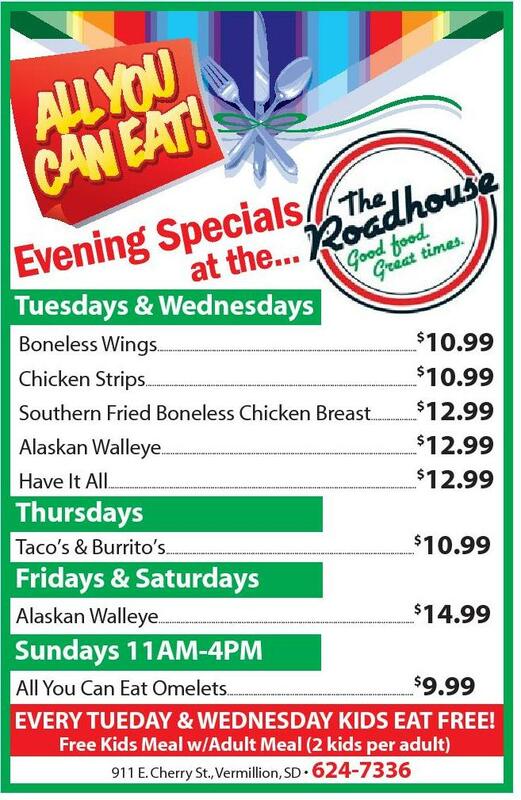 Maskell, NE 68757 Boneless Wings.......................................................................................................................$10.99 Thursdays Great Cooks, Great Food, Great Service 1460 VERMILLION CONSTRUCTION CO. Poured Foundations, Flat Work; 40 Years Experience; Commercial & Residential; Free Estimates. (605)658-2345. WILL REMOVE TREE Stumps. Schumacher Tree Stump Removal, Insured. Dennis Schumacher, Call (402)388-4487. Have It All..............................................................................................................................................$12.99 We serve a wide variety of burgers, sandwiches, pasta, chicken, munchies, as well as breakfast items like build your own omelets and children’s meals. Cleaning Great Extra Income! PT Janitor Needed. Vermillion and Elk Point Area. Please call Korynn (800)456-5470. 1490 th th We’d also like to help those who are less fortunate so when you come in for your free meal we encourage you to bring a non-perishable food item and all of the donations will be taken to our local food pantry. Services PREGNANT AND AFRAID? C a l l Birthright 665-5580 (Yankton); 258-3436 (Sioux City); 3348 4 1 1 (Sioux Falls); 1-800-550-4900 ( t o l l free). 911 E. Cherry St., Vermillion, SD • 624-7336 STORAGE GARAGES: 10x20 w/electricty. $70 per month. Austree Storage, 605-624-8048. 1530 Roofing - Siding Call BK Construction (605)360-1822 for all your remodeling, decks, siding and roofing needs. Free estimate and locally known and insured. 1570 Lost - Found Pets Found: Gray tiger cat, estiimate a year old, found along 19th & Burleigh and Peninah Street on 1/4. Call (605)665-4780.